Established in 1996, the 5Dimes Group has distinguished itself as an online gambling operation through its commitment to integrity, versatility and customer service. 5Dimes.eu, the flagship site of the 5Dimes Group, is a casino, poker room, sportsbook and lottery. In addition, 5Dimes.eu offers customer service online and via telephone 24/7/365 in an array of languages. Recently, 5Dimes upped its game again by adding live dealers, which is notable since 5Dimes.eu is one of the few online casinos accepting US-based players that offers a full sportsbook, online poker room, and now live casino. Click here to visit 5Dimes! 5Dimes offers a 50% welcome bonus on your first deposit for all new casino clients. The minimum deposit is $25 through BTC. The bonus pays out on deposits up to $250, so $125 is the largest bonus that’s claimable through this method. Unlike many online casinos, the promotion does not trigger automatically. Since 5Dimes offers so many welcome packages, you have to open an account, make your deposit, and then choose the specific bonus package you want via live chat or email. All 5Dimes bonuses pay out as you earn them, and 5Dimes awards it in 10 percent increments. In other words, each time you wager the amount of the first deposit, 5Dimes deposits 10 percent of the bonus into your account. For example, if you deposited $250 to take advantage of the full casino welcome bonus, 5Dimes will deposit a $12.50 bonus into your account each time you’ve wagered $250. In addition, 5Dimes offers a “Play $25 On Us” promotion specifically for the live dealer aspect of the casino, and clients can combine this with the bonus described above. So after you have opened the account, made a deposit and selected a welcome bonus package, you should enter the live casino and play $25. Win or lose, contact customer service via live chat, and they will deposit an immediate $25 bonus into the account! Click here to register at 5Dimes. An alternative to receiving a welcome bonus it to opt to pay at the 5Dimes Rebate Live Dealer Casino. Play at the Rebate Live Casino provides a volume-based cash back rebate. Your rebate is credited automatically back into your account after each live gaming session. The more you play, the bigger your rebates! All of the live dealer games at 5Dimes are browser-based, so the client logs in via the website, and then the game launches from there. As far as browser-based games go, these are relatively undemanding, so they should run reasonably well on older computers. Like most modern live dealer setups, 5Dimes uses a combination of the live video feed and a GUI interface. Clients have the option of expanding the video stream and going GUI-light. 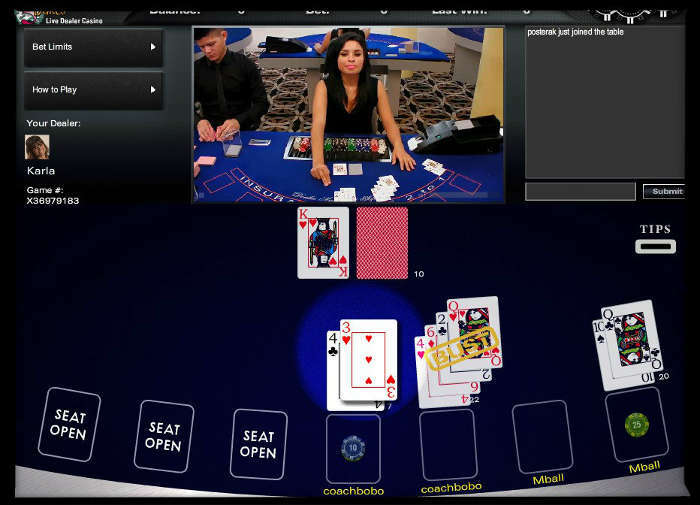 5Dimes does not have HD streams, but the video quality is quite good, and they utilize over-sized playing cards to increase visibility. Overall, 5Dimes is a solid experience. The attractive female dealers perform admirably considering they’re using over-sized cards, and they all speak fluid English clearly. 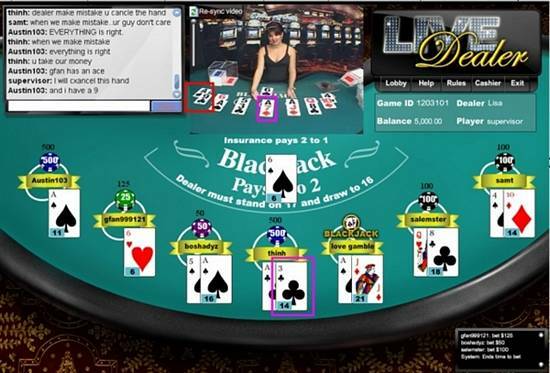 The 5Dimes live dealer casino is powered by Global Gaming Labs, located in San Jose, Costa Rica. As mentioned, 5Dimes accepts USA players and as you might expect, because of this the traffic levels can get high. Nevertheless, 5Dimes does a superb job of balancing that load, and although we did wait for a spot on a table on occasion, it was never very long at all. Blackjack is by far their most popular game. Some of this is due to the hubbub about them having insertion policies favorable to card counters. According to the policy, they insert at 75 percent, but they can insert earlier. Most casinos insert at about 50 percent, and according to our observation, 5Dimes was typically at 60 percent, at worst. It’s nice to believe that there’s a card-counting paradise out there for blackjack players and 5Dimes just might be that place! 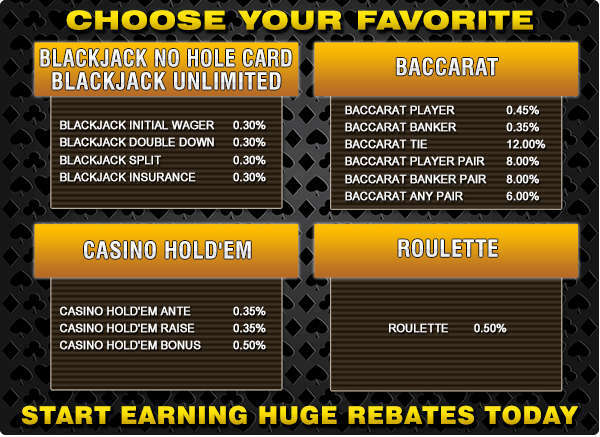 Currently, 5Dimes has live dealers for baccarat, blackjack and roulette. 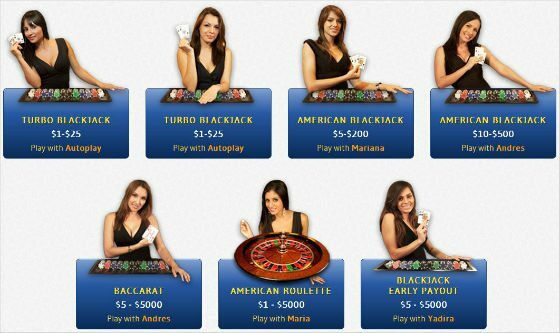 For baccarat, the bet range is $5 to $250, and for blackjack and roulette, it is $5 to $500. All three games only support U.S. currency, and the only language available is English. Roulette uses an American wheel (0, 00), and blackjack is a 7-seat multiplayer setup dealt from a 6-deck shoe. Get $25 free at the 5Dimes Live Casino! And for the latest bonus codes, visit BonusPromoCode.com. If you enjoy sports betting, you can find reviews of the top USA betting sites here. 5Dimes isn't the flashiest site in existence, but it gets the job done by offering all the important services nicely. The sportsbook is pretty plain and simple but they have all the lines you would want to bet on and they pay you out immediately when you win a bet. I've never had any issues with the sportsbook. I just tried the live casino and it's awesome! It's real blackjack and roulette with live streaming video straight from a Costa Rica casino! Amazing stuff and lots of fun. Recommend.